The Lacquer Legion, Adoration: Textured Chevron Tape Mani! Good morning, readers! It’s time for the monthly nail art challenge with The Lacquer Legion and this month’s prompt is “adoration.” You can go to The Lacquer Legion on Facebook for more info on how to join in! I was having a difficult time with this prompt and realized I was over complicating things. Instead of focusing on nail art for the many people and things in my life I adore, I took it down to the basics of some of the things I adore in nail art! Textured polishes, tape manis, turquoise, purple, and one of my fellow nail art bloggers I adore the most: Sarah from Chalkboard Nails! 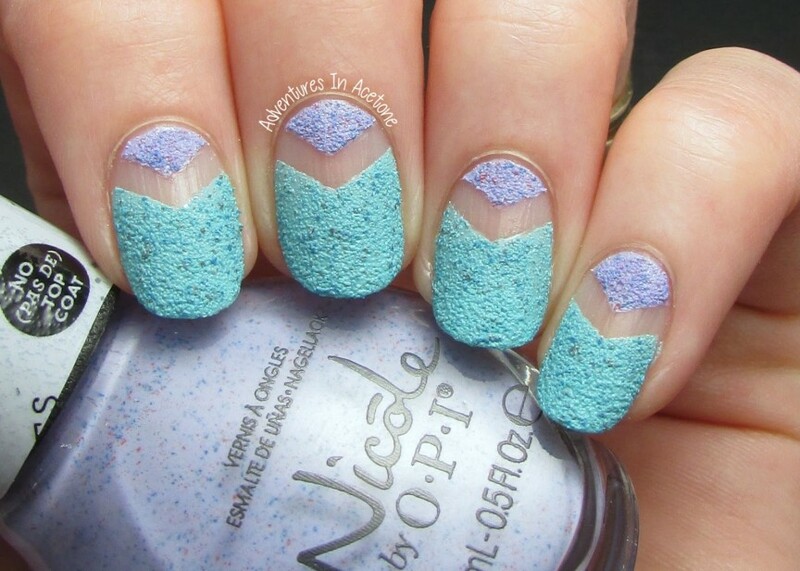 Sarah did a manicure similar to this in January using Nicole by OPI textured polishes and I really liked it. It seemed so simple to apply the tape, or in my case these chevron shaped Sticky Nails guides, directly to the bare nail and then paint the textures on the rest of the nail. It fits in with the “negative space” nail art trend I’ve been seeing as well. I’ve used two of the new Nicole by OPI Roughles textures for this manicure. I’ll have a proper swatch post up soon on the entire collection, but I couldn’t wait to try them in nail art first! Nicole by OPI On What Grounds? is a turquoise matte texture with some colored specks mixed in. Two thin coats for this effect. Nicoly by OPI I’m Stucco On You is a purple matte texture with colored specks as well. Two thin coats for this look. I applied the Sticky Nails chevron tip guide to the desired place on my bare nail and pressed down. Then, I painted each texture on either side on the tape and let dry slightly between coats. After the second coat, I carefully peeled up the chevron tape guide. No top coat, I love the texture! What are your thoughts on this look? Are you excited for these new Nicole by OPI Roughles textures or are you a fan of the textures that have sparkle? I adore everything about this mani (see what I did there?) including the new style of texture! Thanks so much for reading! *The polishes and nail guides used in this post were sent for me to review with my honest opinion. These are so lovely! You did a fantastic job, and they're so springy. I love this! I can't wait until these are available. So excited to see them in nail art!!! this is so original!!!! haven't seen a nail art mani yet with your own nail as part of nail art. So cool!